Standard finish is black oxide. The stud has a screwdriver slot or hexagonal hole for mounting. 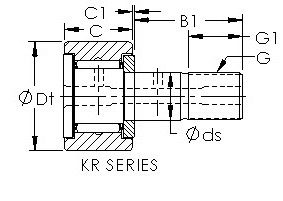 The tire OD is crowned, a cylindrical OD tire is available. Available with integral plastic seals. The stud has an axially drilled hole for lubrication.